You could be forgiven for thinking that by now Mike Laverick’s campaign to get VMware to reinstate their VMTN subscription must have reached saturation point. Even though the software giant has sat up and taken notice – real notice – Mike’s not letting up yet. The latest effort in what is dubbed the “VMTN Subscription Movement” (Twitter: #VMTNSubscriptionMovement) is a series of “miniwags” (a shorter version of Mike’s “Chinwag” podcast), brief video clips of people discussing the VMTN Subscription that Mike is posting on YouTube. Knowing Mike from the London VMUG, I volunteered to do a slot and I’ve somehow ended up being the first miniwagger – his guinea pig if you like. In addition to doing this I popped up briefly on the Veeam Podcast with Rick Vanover a few weeks ago and participated in a short discussion with several other vExperts and the man at VMware charged with looking into resurrecting the VMTN Subscription. You’d think by now that I’d be used to hearing the sound of my own voice. It’s still weird though. A few years back VMware used to have a VMTN Subscription which was their equivalent of Microsoft’s Technet scheme. The purpose of it, like with Technet, was to provide industry professionals with a mechanism of running legitimately licensed software for testing and educational purposes. Last week Mike Laverick launched a campaign to get the VMTN Subscription re-instated on his site. Things moved into VMware’s Community Forums and have picked up significantly, even gaining it’s own Twitter hashtag. Add your views there, tweet your support and use the hashtag #VMTNSubscriptionMovement. I support this campaign. 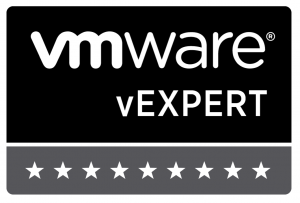 Although as a vExpert, VMware Partner etc. I have access to plenty of legitimate licenses, it hasn’t always been that way and repeated software evaluations are tedious to use. As I write this, I’ve seen confirmation that the campaign has attracted the attention of VMware and they are looking into it. Hopefully there’s good news coming, we’ll see.